Due to their ubiquity in low- and lower-middle income countries, mobile phones are being used throughout the developing world to connect the poor with a range of information and services that can transform their lives: education, election polling information, peer-group (mental health) support, health services, disaster relief, and micro-banking. Indonesia is ranked fifth in the world for number of mobile phone subscribers with over 260 million in 2011 (1) —almost the entire population, including men and women in every socio-economic level—even while 46.1 percent of the population lives on $2 USD per day or less (2).It is hard to imagine how a person living on one or two dollars per day can own and maintain a mobile phone. Rosyid awaiting customers in his shop where he sells secondhand mobile phones, handpon bekas, at prices the poor in Malang can afford. In the United States a person usually acquires a new phone through a service provider at a reduced cost, as an upgrade from an old phone, or even free, in exchange for signing a long-term contract. Or, a person can pay outright for a new phone. Secondhand phones are often exchanged between friends and family, purchased online through sellers of refurbished phones, or tucked into the family “obsolete gadget” drawer. But the market for recycling secondhand phones is growing greatly due to the demand for affordable phones in other countries (3). In Malang, a city of about 820,000 people in East Java, Indonesia, Rosyid sells secondhand mobile phones (Indonesian, handpon bekas) and offers repair services. 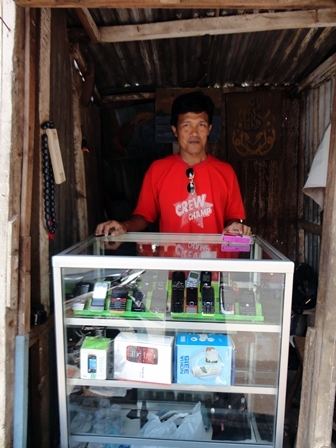 A community leader and salesman in the sub-district of Blimbing, Rosyid’s priority is to make mobile phones available at prices that people in his community can afford. “In order to buy a new phone, we need a lot of resources to buy a new phone. One new mobile phone can get two or three secondhand phones. That is the issue.” Rosyid repairs phones at the community center in Blimbing, and also has his own, modest storefront for selling the secondhand phones nearer to the city center. He sells all types of mobile phones, including popular QWERTY phones, but the current trend has created a demand for touch screen phones. “Whether we like it or not, we must follow the needs and desires of society.” Two years ago, Rosyid and others in his community recognized an opportunity to increase phone sales and to revitalize the secondhand markets in Malang, which lacked both sellers and shoppers. “We thought about how we can create an atmosphere that can make it busy again,” explained Rosyid. They promoted the market, called ROMA (abbrev. of Indonesian, Rombengan Malam, Night Junk), on television and through media accessible throughout the city, and after one month the market was filled with sellers of high-quality secondhand mobile phones and other goods. Now, every night sellers line the sidewalks on Jalan Jenderal Gatot Subroto, and prospective buyers stroll past looking for deals.